In this post we’ll talk about the ways in which you can improve your CSGO gameplay and your FPS by using the best console commands available. Learn how to bunny hop with the CSGO bunny hop commands and speed up your movement in CSGO by having dedicated keys for each grenade. 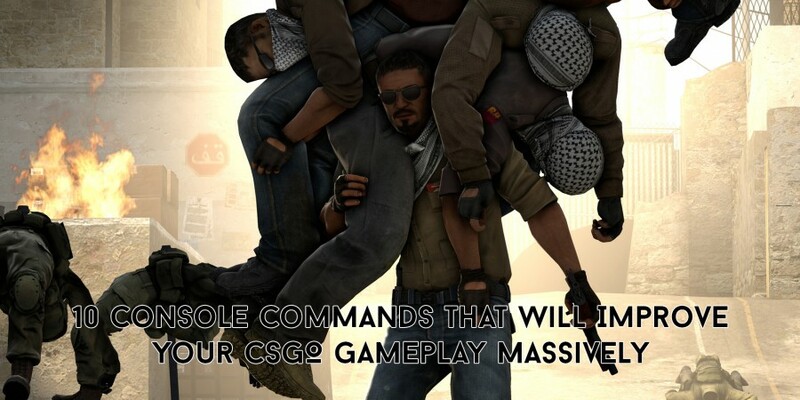 So take a look at our top 10 console commands that will improve your CSGO gameplay including helpful binds for CSGO. The fps_max command is here to set your max frames per second, which will help when you have fluctuating fps or low fps. First you will need to find and monitor your fps, you can either use cl_showfps 1 or net_graph 3 to see your fps on the screen. See what the max, consistent fps you are getting. If it is anything below 60 use fps_max 60, anything below 120 use fps_max 120 and above that it doesn’t matter too much, but it’s always safe to have a max fps, so just add one that is acceptably close to your max consistent fps. When you’re looking at your radar without this command you see a very zoomed in version of the map, not very useful if you want to see where your team mates are half way across the map. Or when you see a glimpse of the bomb you can see exactly where it is. This command zooms the radar out and allows you to see the full map easily. If you have the radar centered all the time this will waste a lot of space displaying black nothing. Whereas if you have this command you can see the full map even when stood against the edge of the map. Highly useful for radar use. Don’t like the ‘who killed me’ camera angle after you die? This command gets rid of it completely. Back in the day when bunnyhopping or bhopping was the norm and you could gain ridiculous boosts simply from strafing side to side and jumping at the right time, mwheeldown or mwheelup were necessary as jump to gain this boost. Now, bunnyhopping still exists, but now more on bhop_ servers or on regular servers for a couple of jumps rather than to get a really quick pick at a site because you arrived quicker than anyone expected or to speed up rotation. Nevertheless I feel it is better and easier to use the mouse wheel to jump as it allows you to jump at the exact moment you hit the ground and, to be honest, it just feels more natural. My recommendation would be to use mwheelup, but that is all personal preference. This row of commands binds a key to buy a flashbang, a grenade and a smoke, in that order. If you run out of money before you buy all three it will not buy a smoke, then a nade, then a flash so you should always have a flash if you use this bind. This is great for fast freeze time buying or for the lazy gamer who can’t be bothered clicking through the buy menu. This will effect your sensitivity when you are scoped in using a sniper rifle. Don’t alter this, make sure it is on 1. If it is not on 1 it will feel weird and ruin your mouse movement when you scope and again when you unscope. This is necessary if you’re going to be throwing more than one grenade a round, which I assume every player does. Scrolling through your nades menu, pressing 4, 4, 4 to get a smoke out is too long. You need nades and you need them fast! Bind a dedicated button to each grenade to ensure a quick draw and be sure to be the first person to throw the nade, molotov, smoke or flash. People shouting and screaming in matchmaking over the mic is one of the most annoying things in CounterStrike. This command turns this down. Voice_enable 0 turns off the voices and voice_scale turns them down. This makes sure that you don’t time out. The number can be anything over 1000, I thought 1337 was fitting here. And that’s that. If you have any other commands you find particularly useful post them in the comments below!